Your opinion matters. 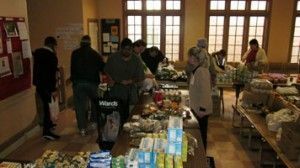 Leave A Review Or Edit This Listing for Clay street food pantry. Located at corner of 13th and clay in downtown Portland Or, Serving the public the forth thursday of each month. If you have your own bags please bring them. use ramp to get into church there you will be given a number. doors open at 1 pm and we go till 6 pm sometimes a second run through can be done at 5:30. Refreshments are served while you wait. Dog food and cat food are sometimes given to those that need it. Ask if we have it also ask for special needs items like baby food and soy milk. These are held for those that need it. Please only take what you are to take as we do have many to feed. Also ask about our other meal programs. Volunteers are needed, please join us for a volunteer meeting the third Thursday of the month at 2 pm. We always need more information on our pantries. If you know of any details, volunteer information, website, hours or more description information about Clay street food pantry please add a comment (below the map on this page), with information. We will then display this for all visitors on this page.